Meet the newest member of the Copain team! As a kid growing up in Napa, I looked up to people working in the wine industry because they worked hard and it looked like they were having so much fun. Working with your hands and drinking wine? What’s not to love!? As it became time to figure out what I wanted to do with my life, I thought I would pursue my dream of becoming a winemaker. 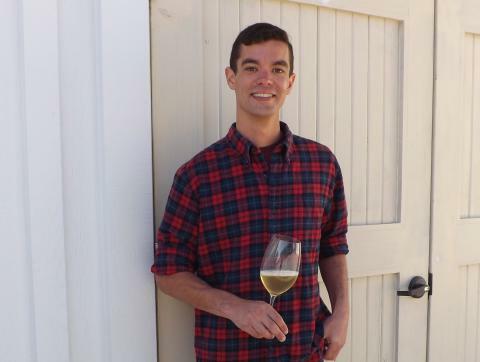 I decided to study Wine and Viticulture at Cal Poly, and chose to concentrate in Enology. I found out about a cellar position at Cambria Winery through a career fair, and began paying my dues. One year was spent at Cambria, learning cellar and lab operations, and then I moved to Byron where I sharpened my Pinot Noir winemaking skills under the tutelage of Jonathan Nagy. I loved my time on the Central Coast, but it was time to come home and I moved to a large production facility in Geyserville. I think learning how to make wine at that scale is crucial; you learn things you wouldn’t learn at smaller facilities, and you learn things quickly. The chance to work with small lots of high end Pinot Noir, and learn a new style of winemaking seemed like a dream! I’m really excited for this year’s harvest, and can’t wait for the grapes to start rolling in. In my spare time, I love spending time with my girlfriend in San Francisco, snowboarding during the winter, and making beer (the hoppier the better! ).